Fantastic transition from the previous book! 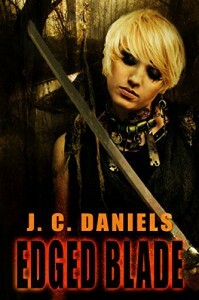 What I liked: I am extremely pleased with Ms Daniels' way of handling her main character. Kit has been through the wringer in the last two books. Ms Daniels didn't gloss over the horrific incidents and their impact on Kit. Getting over what happened to her will be a long process and the author is staying true in that fashion. Kit is doing better and she is finally ready for some quality time with Damon, the alpha of the local shapeshifters. Their first date in a while is not exactly what she's expecting though. She's thrown into proximity with lots of vampires, which is so not a good thing for her. In addition, Justin finagles her into helping him with a case that directly affects all the supernaturals. Trying to get the witches, vampires and shapeshifters to work together and share information is only one of the many problems facing Kit and Justin. Throw in a squeeze from Damon's past looking to cause trouble and you have a book you will want to read in one sitting. I did!! Ms Daniels was already a veteran writer when she self published the first in the Kit Colbana Files series. So you know up front, you are getting a quality book. The pacing is great, the world building fantastic and the characters (at the least the good ones) have all claimed a piece of my heart. Kit is still evolving as are the characters around her as the author puts them through some excruciating circumstances. My jaw dropped when Ms Daniels inserted an unlikely budding romance, then she never mentioned it again. Titillating to say the least! What I didn't like: My big complaint is the wait between books but as Ms Daniels also writes as Shiloh Walker and has many other series with contracts, I can understand the delay. I don't like it but I understand it. The flip side, before each Kit Colbana Files release, I re-read the previous books. Yes, they are re-readable!! I highly recommend this series!!! !